Ephrem the Syrian (306 – 373) was a deacon, prolific writer of hymns, and theologian of the fourth century. He is venerated by Christians throughout the world, and especially among Syriac Christians, as a saint. Ephrem wrote a wide variety of hymns, poems, and homilies in verse, as well as prose biblical commentaries. These were works of practical theology for the edification of the Church in troubled times. So popular were his works, that for centuries after his death, Christian authors wrote hundreds of pseudepigraphous works in his name. Ephrem's works witness to an early, vibrant expression of Christian faith, little touched by the European modes of thought, and more engaged with Eastern methods of discourse. Long venerated in the East, he was declared a Doctor of the Western Church in 1920. The newly excavated Church of Saint Jacob in Nisibis, where Ephrem taught and ministered. Ephrem was born around the year 306 C.E. in the city of Nisibis (the modern Turkish town of Nusaybin, on the border with Syria). Internal evidence from Ephrem's works suggests his parents were part of the growing Christian community in the city, although later hagiographers wrote that his father was a pagan priest. Numerous languages were spoken in Nisibis, mostly dialects of Aramaic. The Christian community used the Syriac dialect. Various pagan religions, Judaism, and early Christian sects vied with one another for the hearts and minds of the populace. It was a time of great religious and political tension. In 298, the Roman Emperor Diocletian had signed a treaty with his Persian counterpart Nerses that transferred Nisibis into Roman hands. The persecution of Christians under Diocletian was an important part of Nisibene church heritage as Ephrem grew up. Jacob, the first bishop of Nisibis, was appointed in 308, and Ephrem grew up under his leadership of the community. Ephrem was baptized as a youth, and seems to have become a "son of the covenant," an unusual form of Syrian proto-monasticism. Jacob appointed Ephrem as a teacher (Syriac malp̄ānâ, a title that still carries great respect for Syriac Christians). He was also ordained as a deacon. He began to compose hymns and write biblical commentaries as part of his educational office. Ephrem is popularly credited as the founder of the School of Nisibis, which in later centuries was the center of learning of the Church of the East. In 337, Emperor Constantine I, who had legalized and promoted the practice of Christianity, died. Seizing on this opportunity, Shapur II of Persia began a series of attacks into Roman North Mesopotamia. Nisibis was besieged in 338, 346, and 350. During the first siege, Ephrem credits Bishop Jacob as defending the city with his prayers. Jacob died soon after the event, and Babu, who succeeded him, led the church through the turbulent times of border skirmishes. In the third siege (350) Shapur rerouted the River Mygdonius to undermine the walls of Nisibis. The Nisibenes quickly repaired the walls while the Persian elephant cavalry became bogged down in the wet ground. Ephrem celebrated what he saw as the miraculous salvation of the city in a hymn which portrayed Nisibis as being like Noah's Ark, floating to safety on the flood. 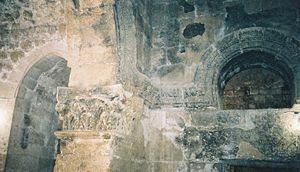 An inscription in the baptistery of Nisibis states that it was constructed under Bishop Vologeses in 359, the year that Shapur began to harry the region once again. The cities around Nisibis were destroyed one by one, and their leading citizens were killed or deported. The Roman Empire was preoccupied in the West, where Constantius II and Julian struggled for overall control. Eventually, with Constantius dead, Julian the Apostate began his march into Mesopotamia. His reign made life more difficult for Christians, who had formerly received special privileges from the state. Julian also began an unsuccessful march against the Persian capital, Ctesiphon, where, overstretched and outnumbered, he was forced into a retreat along the same road. Julian was killed defending his retreat, and the army elected Jovian as the new emperor. Unlike his predecessor, Jovian was a Nicene Christian. However, he found it necessary to ask for terms from Shapur and conceded Nisibis to Persia, with the provision that the city's Christian community would leave. Bishop Abraham, the successor to Vologeses, led his people into exile. Ephrem found himself among a large group of refugees that fled west, first to Amida (Diyarbakır), and then settling in Edessa (modern Şanlıurfa) in 363. Now in his late 50s, Ephrem applied himself to ministry in his new church, and seems to have continued his work as a teacher. Edessa had always been at the heart of the Syriac-speaking world and the city was full of rival philosophies and religions. Ephrem wrote that orthodox Nicene Christians were simply called "Palutians" in Edessa, after a former bishop. Arians, Marcionites, Manichees, Bardaisanites, and various Gnostic sects also proclaimed themselves as the true church. In this confusion, Ephrem wrote a great number of hymns defending Nicene orthodoxy. 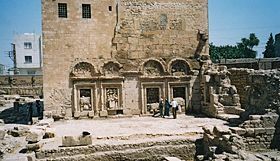 A later Syriac writer, Jacob of Serugh, wrote that Ephrem rehearsed all-female choirs to sing his hymns set to Syriac folk tunes in the forum of Edessa. After a 10-year residency in Edessa, in his sixties, Ephrem succumbed to the plague as he ministered to its victims. The most reliable date for his death is June 9, 373. Over 400 hymns composed by Ephrem still exist. The church historian Sozomen credits Ephrem with having written over three million lines. Ephrem combines in his writing a threefold heritage: he draws on the models and methods of early Rabbinic Judaism, he engages skillfully with Greek science and philosophy, and he delights in the Mesopotamian/Persian tradition of mystery symbolism. The most important of his works are his lyric teaching hymns (madrāšê). These hymns are full of rich, poetic imagery drawn from biblical sources, folk tradition, and other religions and philosophies. The madrāšê are written in stanzas of syllabic verse, and employ over 50 different metrical schemes. Each madrāšâ had its qālâ, a traditional tune identified by its opening line. All of these qālê are now lost. It seems that the "heretical" teachers Bardaisan and Mani composed madrāšê, and Ephrem felt that the medium was a suitable tool to use against their claims. The madrāšê are gathered into various hymn cycles. Each group has a title—On Faith, On Paradise, On Virginity, Against Heresies, etc. Each madrāšâ usually had a refrain, which was repeated after each stanza. Later writers have suggested that the madrāšê were sung by all women choirs with an accompanying lyre. Particularly influential were his Hymns Against Heresies. He lamented that the faithful were "tossed to and fro and carried around with every wind of doctrine, by the cunning of men, by their craftiness and deceitful wiles" (Eph 4:14, as quoted in Mourachian 2007). He devised hymns laden with doctrinal details to inoculate right-thinking Christians against heresies such as docetism. These hymns employ colorful metaphors to describe the Incarnation of Christ as both fully human and fully divine. Ephrem also wrote verse homilies (mêmrê), although these sermons in poetry are far fewer in number than the madrāšê. The mêmrê are written in a hepto-syllabic couplets (pairs of lines of seven syllables each). The third category of Ephrem's writings is his prose work. He wrote biblical commentaries on the Diatessaron (the combined single gospel of the early Syriac church), on Genesis and Exodus, the Acts of the Apostles, and the Pauline Epistles. He also wrote refutations against Bardaisan, Mani, Marcion, and others. Ephrem wrote exclusively in the Syriac language, but translations of his writings exist in Armenian, Coptic, Georgian, Greek, and other languages. Some of his works are only extant in translation (particularly in Armenian). Syriac churches still use many of Ephrem's hymns as part of the annual cycle of worship. However, most of these liturgical hymns are edited and conflated versions of the originals. The most complete, critical text of authentic Ephrem was compiled between 1955 and 1979 by Dom Edmund Beck, OSB as part of the Corpus Scriptorum Christianorum Orientalium. Ephrem's artful meditations on the symbols of Christian faith and his stand against heresy made him a popular source of inspiration. The is a huge corpus of Ephrem pseudepigraphy composed in his name and legendary hagiography. Some of these compositions are in verse, often a version of Ephrem's heptosyllabic couplets. Most of these works are considerably later compositions in Greek, rather than Syriac. Students of Ephrem often refer to this corpus as having a single, imaginary author called Ephraem Graecus (Greek Ephrem). Although Greek compositions are the main source of pseudepigraphal material, there are also works in Latin, Slavonic, and Arabic. There has been little critical examination of these works, and many are still treasured by churches as authentic. The most well known of these writings is the Prayer of Saint Ephrem that is a part of most days of fasting in eastern Christianity. Soon after Ephrem's death, legendary accounts of his life began to circulate. One of the earliest of these is the statement that Ephrem's father was a pagan priest. However, internal evidence from his authentic writings suggest that he was raised by Christian parents. This legend may be anti-pagan polemic or reflect his father's status prior to converting to Christianity. The second legend attached to Ephrem is that he was literally a "monk." In Ephrem's day, monasticism was in its infancy in Egypt. He seems to have been a part of the members of the covenant, a close-knit, urban community of Christians that had pledged themselves to service and refrained from sexual activity. Some of the Syriac terms that Ephrem used to describe his community were later used to describe monastic communities, but the assertion that he was monk is anachronistic. Later hagiographers often painted a picture of Ephrem as an extreme ascetic. Ephrem is venerated as an example of monastic discipline in Eastern Christianity. In the Eastern Orthodox scheme of hagiography, Ephrem is counted as a Venerable Monk. Ephrem is also popularly believed to have taken legendary journeys. In one of these he visits Basil of Caesarea. This links the Syrian Ephrem with the Cappadocian Fathers, and is an important theological bridge between the spiritual view of the two, who held much in common. 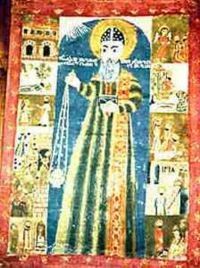 Ephrem is also supposed to have visited Saint Pishoy in the monasteries of Scetes in Egypt. As with the legendary visit with Basil, this visit is a theological bridge between the origins of monasticism and its spread throughout the church. Ephrem the Syrian presents an engaging model of Eastern Christianity. He shows that poetry is not only a valid vehicle for theology, but is in many ways superior to philosophical discourse for the purpose of doing theology. He also encourages a way of reading the Bible that is rooted more in faith than in critical analysis. Ephrem displays a deep sense of the interconnectedness of all created things. There are also modern studies into Ephrem's view of women that see him as a champion of women in the church. Other studies have focused on the importance of "healing" imagery in Ephrem. He confronts the contemporary church as an orthodox saint engaged in a theology that is at once non-Western, poetic, ecological, semi-feminist, and healing. The most popular title for Ephrem is Harp of the Spirit Kenārâ d-Rûḥâ. He is also referred to as the Deacon of Edessa, the Sun of the Syrians, and a Pillar of the Church. Ephrem has long been recognized as a great saint and "Venerable Monk" of the Eastern Orthodox Church, in which his hymns, though probably not in the original form, are still sung. On October 5, 1920, Pope Benedict XV proclaimed that Ephrem as a Doctor of the Church in the Catholic tradition. The boldness of our love is pleasing to you, O Lord, just as it pleased you that we should steal from your bounty.—Hymns on Faith 16:5. All links retrieved August 21, 2017. History of "Ephraem the Syrian"
This page was last modified on 21 August 2017, at 16:07.